Gregory Keen is an agent with MI-5. With the imposing name of Gregory George Athelston Keen, the hero of this three-book series is a serious, determined former Major in the British Army, now an experienced agent in Special Service of Home Security, or MI-5 as it is more commonly known. He has been doing so for several years prior to the first recorded adventure, long enough to have established a good reputation and a confidence in his own abilities. The particular department in MI-5 for which he works is known to one and all as "Crossbow". Little of his background is mentioned, other than his being around 34 years of age, although in passing it is obvious that he had served in Military Intelligence during WWII. Somewhere along the way he gained ability in a couple of different languages and is an expert in Russian. He is single with a good eye for the ladies but not one to let a pretty leg sway him from his task. One female with a practiced eye for men noted that he had an odd, disturbing brown face with smooth skin unblemished except for faint lines at his eyes. He possesses a wide forehead with high cheekbones. Slender in build and not particularly tall he gains attention not through his appearance but through his demeanor. One thing that both seems to enhance and detract from people's take on him is his partiality to sweaters and tweed jackets. Clearly he is not particularly worried about what others think of him. Based on his activities, Keen is a very good detective in addition to being a trained agent. His methodical process of studying the evidence and coming to the correct conclusion is demonstrated clearly. Backing him up on his missions is the junior but still dependable Agent Coutts with whom Keen has a good relationship. Keen knows Coutts quite well and considers him his right-hand man. When Coutts is not able to back him up, Keen is not so much concerned as just annoyed. Coutts is Keen's sounding board and in that regard is irreplaceable. Coutts' proficiency with a knife is another reason Keen values him. But Keen does not have to backed up. He can take care of himself quite well if need be and the need does arise on several occasions. Still, Keen would prefer to use his brain instead of brawn and as the people he goes up against find out, his brain is especially good. The man called Dumetrius was one of Europe's most notorious criminals, a man who had pulled off a huge caper and killed without mercy doing so. Now he was believed to be in the U.K. and Gregory Keen is determined to catch him. This is a novelization of Dossier on Dumetrius (1951). Gregory Keen assumes the identity of a journalist as he heads to the far east to track down a German scientist with a British passport who may have gone over to the other side, or might have been kidnapped. 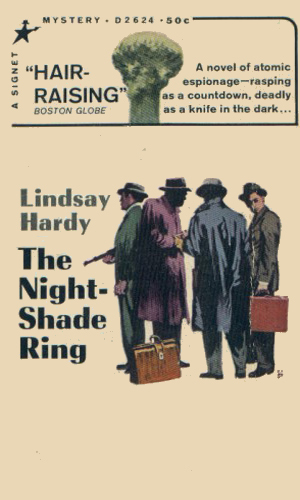 This is a novelization of Deadly Nightshade (1951). Gregory Keen's latest task is to find the diaries of a British Admiral named Foreman and only a luscious blonde can be of help but she is hunted by others who would like to see her dead first. This is a novelization of 26 Hours (1952-3). 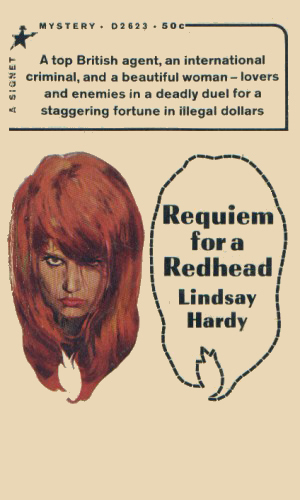 The first adventure, The Dossier On Dumetrius, was made into a movie titled Million Dollar Manhunt, also released as Assignment Redhead, in 1956. 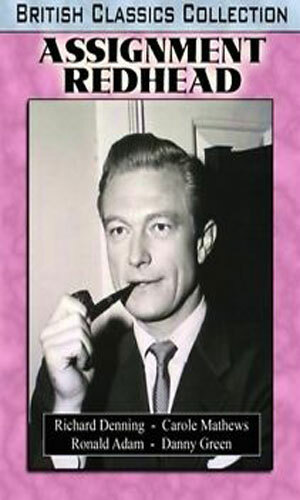 It starred noted actor Richard Denning as Keen. Denning was better known as playing Michael Shayne in 1960 and the governor on the original Hawaii Five-O series from 1968-1980. Dumetrius is not content with his counterfeiting of money and documents, he wants to make sure no one bothers him in his craft and will kill without remorse. Keen is put on his trail. Created originally for Australian radio, the Gregory Keen adventures were in the form of serials entitled The Adventures of Major Gregory Keen of M.I.5 that ran from 1951 to 1957. Each program was a short 12 minutes long but there were an impressive 104 episodes in each adventure, making the entire case last 20 hours. There were actually 5 separate adventures (5 x 104 x 12 minutes). In the first three adventures, which were turned into novels, the role of Keen is played by New Zealand actor Bruce Stewart. The other two adventures, Two Roads To Samarra and The Smell Of Terror, followed these three after a while but a different actor played Keen. No novelization of these two adventures was done. One of Europe's most dangerous criminals, a man named Dumetrius who has no qualms about killing those in his way, is thought to be in England and it is Gregory Keen's job to find him. A German scientist working for the British may have defected to the Reds or he may have been kidnapped. It is up to Gregory Keen to find out which and get him back. A British admiral put too much into his diaries and some of it was inflammatory enough to start wars. They have gone missing and Gregory Keen must get them back. Gregory Keens job is to act as bodyguard to a oil magnate's daughter as he pulls her from hiding in mainland Europe and takes her to Scotland. 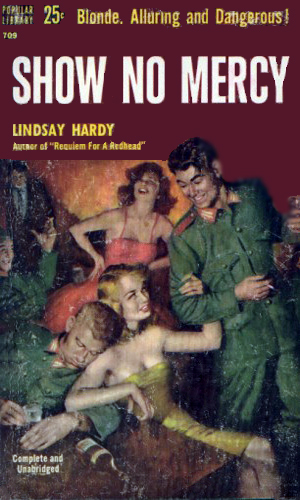 SMERSH, the Soviet anti-spy assassins, are sent to kill her and Keen. Now retired, Gregory Keen accepts the invitation to go to a Caribbean estate of an old friend but soon learns that she is being pressured to sell her land to the dictator. When Keen speaks up, he is arrested. Before 007 came on the scene, Major Keen was already protecting England by hunting down spies from other countries. The books came later so it looks like Bond beat Keen but that definitely was not the case. The Keen books, being based on the radio serials, did not have any of the prurience that Fleming was able to put in but for spy work, they were comparable. For spy-fi fans, this is a must. It is not only good; it is a great example of espionage fiction of the time. Keen is a man of action who finds a lot of it. Mr. Hardy did an incredible job with this series. Following the serial episodes quite closely, they nevertheless do not read as most novelizations do, certainly because he had written both the serials and the novels. These read as solid spy adventure stories. I just wish he had put more about Keen's background in. In the serials there would not have been time but nothing prevented him from putting it in the books. Oh, well! If you can surf the web, you might be able to get your hands on the radio episodes. They are very enjoyable and besides being very entertaining, they are a great time machine back sixty-plus years.